I recently had the pleasure of meeting Christine Hoffman, creator of the blog Pies and Aprons. I quickly learned that we have two common interests: antiques and baking. Christine is an interior decorator. She is one of those people who can walk into a room and envision new color schemes, combine unlikely pairs of furniture and accessories, and walk out having created a relaxing, inspiring place to retreat. I wish I had that kind of vision. One of her homes was once featured in Country Living magazine. Flipping through the glossy pages, I realized I was packing my bags in my mind and ready to move in. One of the things we discussed was our many creative outlets and how we’re always trying to add to our repertoire of talents. We talked about sewing and how, despite a deep desire to be able to sew, we’re both afraid of sewing machines. And then she made a comment that really resonated with me. “I’m just going to have to accept that I’m never going to sew,” she said. “I don’t have to do everything.” And there it was. That part of my life that I’ve struggled with for so many years was suddenly staring me right in the face in the form of a single sentence. And I had to admit that she was right. I grew up with two brothers (identical twins) and boys tend to be competitive. Well, girls can be too. I played most of the sports the boys and their friends did and tried my best to compete at their level. I learned to downhill ski in junior high and quickly moved on to snowboarding for an extra challenge. Even though the first time out I sprained my wrist and my knees were purple for a week, I was completely in love with the sport. 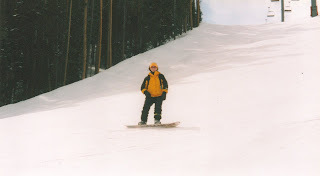 In high school I got the opportunity to go to Colorado and even had a ½ day private snowboarding lesson. One of the greatest thrills of my life was gliding down that mountain listening to my board carve through the groomed trail and feeling my face break through the mountain air. I wanted to prove that girls could do anything and I didn’t limit myself to sports. From there it was art. I drew in high school, did photography in college and since then I’ve picked up jewelry making, visual journaling, altered books and card making (to name a few). I am also a writer: poetry, fiction, and creative non-fiction. And now I can add novice cook/baker to my list of creative skills. I love that I’ve tried so many different things in my life, although sometimes I wish I could be an “expert” at just one single thing. Like the rest of the world, I was glued to the TV for the past two weeks watching the Olympics. My favorites, of course, were the snowboarding events. I remember watching Shaun White and being in complete and total awe of his fearlessness and dominance on the half pipe. For his final run, the gold was secure, so he could have done nothing at all and still walked away an Olympic champion. But he chose to pull out his full bag of tricks and really go out with a bang. He was simply amazing to watch. I desperately wanted that exhilaration that Shaun felt when all his hard work paid off and he became a champion. I’m at that point in my life where there are so many things that I feel I am supposed to be doing, yet don’t have the means of accomplishing. The pressure and frustration can be suffocating. So, I decided that I needed to simplify, get back to basics. And ironically, there was a recipe in the box for that. 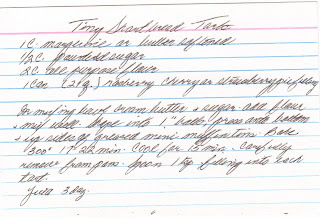 Tiny Shortbread Tarts have four ingredients. They’re simple to make and they have that classic, dependable taste that makes me smile every time I bite into one. And the dollop of raspberry pie filling on the top is just sweet enough to seduce your taste buds without overpowering the simplicity of the cookie. The hardest part is waiting for them to bake and cool down before popping one (or three) into your mouth. It was just the recipe I needed to gain some perspective on my life. Later, I sat at my desk to write. As I paused between thoughts, I glanced around the room and my eyes stopped on an object: my snowboard. I haven’t been on it in years, not since I injured my back, but it stands like a sentry against my bookcase, keeping my memories of that day on the mountain in Colorado securely locked in its bindings. Someday, I want to return to those tree-lined paths of packed snow and carve my way down the trails. Maybe I could get a lesson from Shaun White (dream big right?). But until then, I have to remember that although I’m not an Olympic champion and even though there’s a lot that I can’t do right now for whatever reason, there is still a lot to give me cause for celebration. Hey, I can bake a Queen of Hearts Cake! And I’m glad that I’m not an expert at just one thing. I have my own bag of tricks that I can reach into when I need a moment to let myself shine and that bag is overflowing with options. Who knows, maybe someday I’ll overcome my fear of the sewing machine and I can throw that into the mix too. I know I’m not the only one out there in my situation. This economy has caused a lot of people to redefine their lives and rethink their dreams. It’s not an easy thing to do, but sometimes, by taking a step back we actually move forward. If you’re one of those people, I just want to say – hang in there. I always thought that at this point in my life I’d be married, have a steady job, kids, and would have stepped foot on European soil. Instead, I have a wonderful and supportive husband, an amazing dog, and a cooking blog (1 out of 4 isn’t bad). They all make me incredibly proud and happy and isn’t that what being a champion is all about anyway? Life is an interesting balance of cutting ourselves some slack and remembering that we don’t have to do everything, but at the same time having faith that we are, in fact, capable of doing anything. It’s a complex thought for complex times, but in the end, it will make our lives much simpler. And when life gets to be too overwhelming, head to the kitchen. Sometimes the answer can be found in four simple ingredients. Yes! What a great post, Molly. So glad I finally got around to checking out your blog. It is fabulous, and I will be back to comment more often.